Evernote: for note taking.. Previously used OneNote but then moved on. I have been living near MHOW (Military HQ of War) where I used to see some fighters getting transported on the back of truck. That was my closest encounter with this heart throbbing machines. Then I saw them flying around Tambaram airbase, Chennai during office hours. The power, speed, super sonic sound and ability to do massive destruction is what makes them interesting. Whenever I see them in Hollywood movies, I live a second life in my dream as an air-force pilot. Wearing an Aviator with dashing blue (or green sometimes) dresses leaves an inspiring and brave image. What a life! Recently, I got an opportunity to attend Australian international air show organized at Avalon Airport near Melbourne to understand and see more about aviation closely. I was waiting for it since few weeks. On the photography front, I ordered a telephoto canon 70-200 F4 IS for this event but it couldn't be delivered on time by FedEx. I would curse FedEx for that - lazy service. Many teams participated in the event like US Air Force (USAF), Singapore (RSAF), Australia, Japan, NZ and French Air Force showcasing F18 Super Hornet, F22 Raptor, Spitfires, F16s, C17 Globemaster, PC/9/A (Roulettes), Predator, Super Puma, Pilatus, Hawk 127 and many more. Full list here. Since this was the first time I was attending such event, I didn't knew much about it though I read few articles as preparation but still there is some learning that I would like to share. Pack up light and carry only important things. Do not carry which you thing that you will not probably not going to use. Take a folding chair so that you can relax on a long day. I really missed this thing during the second half of the day. Take lots of food, water, juice etc to nourish yourself. You will always find food joints on such place but most of the time they are heavily crowded and there will be long line on each of them. Take everyone in your family just like a picnic. You will enjoy more. Now coming to photography, take out your biggest lens from the box to really get close to the flying planes. I would say best is 100-400mm range in telephoto and also take a moderate wide angle (24 - 35 mm) for taking the pictures of formation display. For a heavy lens, take a monopod for support. Keep extra batteries and memory cards as you will be taking lot of pics in burst mode which will fill up very fast. For normal planes, minimum shutter speed should be 1/500 sec and for super sonic fighters like F18 Super Hornet or F22 Raptor, pick 1/1000 sec or faster. You can break this rule to create awesome looking panning shots of flights moving on the runway. I used single center focus all the time because it makes the autofocus pretty fast and I can track the subject very quickly. Reach early to secure a good place near the runway and avoid the clutter in front of you. If you can't bear the awesome super sonic sound, then don't forget to take the ear buds with you. This is essential for kids. Overall it was a great experience which makes me think that I should attend such event again. I would like to see Indian aerobatic team Suryakiran performing in future. First of all those who don't know about Wetlands, I would like to quote its formal definition. 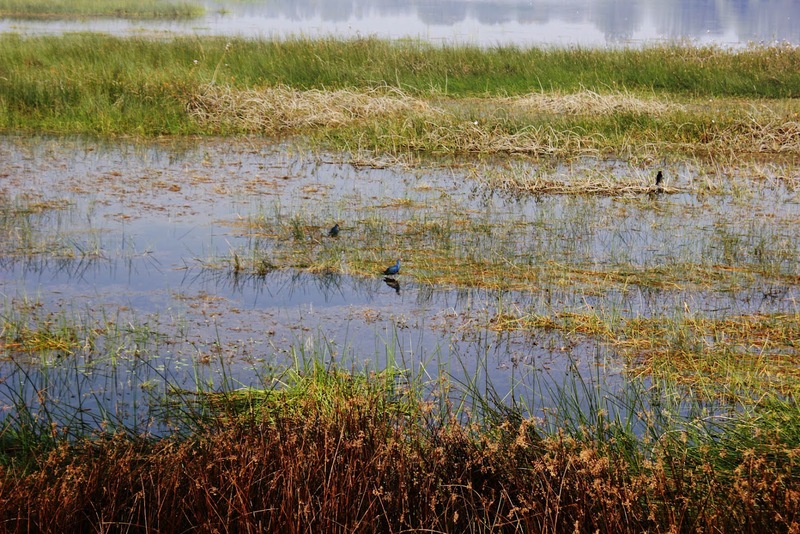 "Wetlands are areas where water covers the soil, or is present either at or near the surface of the soil all year or for varying periods of time during the year, including during the growing season. Water saturation largely determines how the soil develops and the types of plant and animal communities living in and on the soil. Wetlands may support both aquatic and terrestrial species. The prolonged presence of water creates conditions that favor the growth of specially adapted plants and promote the development of characteristic wetlands soils." To celebrate and to share awareness about the conservation of Wetlands, The Nature Volunteers group (TNV) organized a photo walk and bird watching camp at Sirpur Tank (is also a Wetland). It is important to save various species of plants, birds, mammals who survives just because of the condition provided by wetlands. Also it helps in maintaining our ground water levels and helps human population to survive. d) Use of plastics, polythene etc. 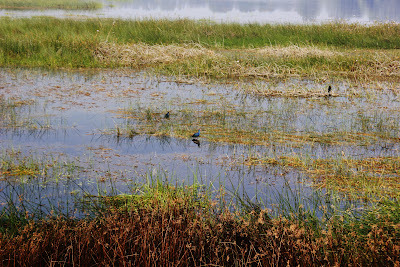 Each wetland is a home for variety of species and they are sometimes found only in that particular region. So think of loosing hundreds of species from Nature if you loose one of them. Its a very important channel to connect land and water. You can read more information here - http://www.defenders.org/wildlife_and_habitat/habitat/wetlands.php and http://www.wetlands.org/Default.aspx and take steps to protect the wetland near you. Yesterday, I attended a seminar "Keyword approach to Wildlife Photography" by Mr. Saleel Tambe who is a famous wildlife photographer, authored various books and had experience of more than 15 years. You can read more about him on his website. The seminar was more of a philosophical aspect of photography. He shared his experience and secrets which is not only specific to nature photography but as for all aspects of it. Past one week I have been testing the spokn paid service to call International numbers. It is a VOIP telephony service of one of its kind started from India, similar to Skype but way cheaper than it. I am bit disappointed with the quality of call, it is not clear and latency is high. They have application on most of the platforms but not on Android which is unusual though they say it works with any SIP client (I have not been successful anyway).